Lorene Eppolite is the designer behind Cre8tion Crochet. She has been designing since October 2012. She loves to create fun and easy crochet accessories and garments. She strives to make her designs to be achievable for any skill level. Just because it is easy, doesn't mean it can't be beautiful. Lorene was named one of the Top Ten Designers by The Yarn Box in 2012 and by AllFreeCrochet in 2013, 2014 and 2015. Follow Lorene on Facebook, Pinterest or Twitter. You can also subscribe to the Cre8tion Crochet Weekly Newsletter for weekly free patterns, discounts on paid patterns, reviews and giveaways and business tips. This intermediate granny-square afghan is worked up in beachy shades of tan, white and jade to make a throw reminiscent of sand dollars on the beach. 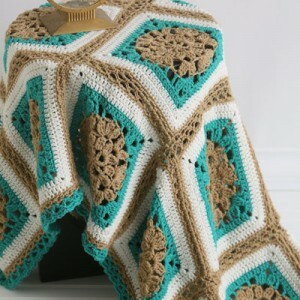 Perfect for an on-the-go project, this afghan is a great way to bring the sandy shore into your home.